This exercise is designed to explore how you and your fellow students perceive the role and perception of marketing. Listed below is a series of statements about marketing. Identify which ones do you agree with and which ones you disagree with? When you have finished, compare your perceptions against those of your fellow students . Marketing is simply another word for advertising. The main goal of marketing is to maximize the number of customers, all other goals are not as important. People who are successful in marketing are really creative and outgoing – but are not that good with numbers and statistics. Marketers do not usually end up as CEO’s. Most CEO’s have a finance, engineering, or legal background. People in marketing roles tend to have little interaction with staff from other departments (functions) within a firm. Marketers tend to be seen as wishy-washy, because they are constantly changing their minds. Marketing is all about making people buy products who don’t really want them. Marketing is a highly regarded profession throughout the business community. Many key marketing decisions within a firm are so important that the CEO (or the senior executive team) often undertakes them (rather than the marketing department). Marketing tasks are fairly simple, particularly compared to complex and serious roles/functions like finance and engineering. Which of the above statements do you agree with? Which ones are you not sure about? 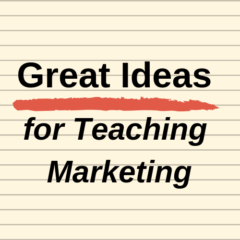 Are your perceptions of marketing similar to your fellow students? As perceptions of marketing sometimes differ in the business world, what implications would this have for the profession of marketing? Next Next post: What is marketing?